Hey peeps! Who all watches Ghost Adventures? 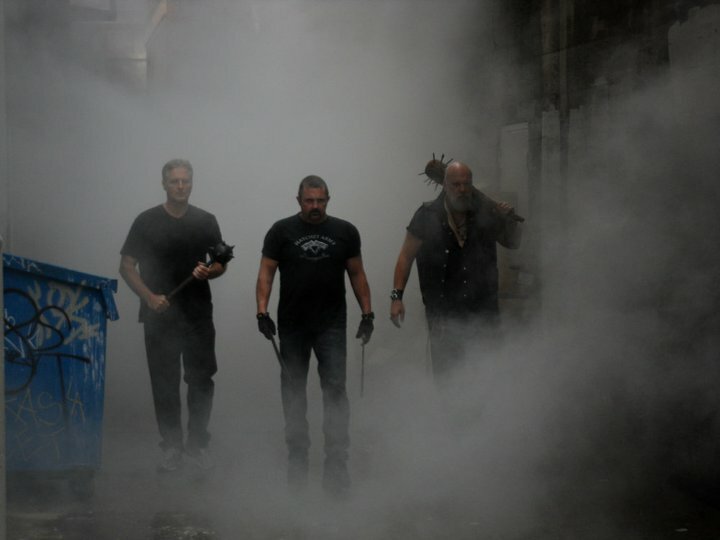 Zack, Nick and Aaron go to some outlandish places every Friday night searching for ghost and tonight at 9 pm EST on The Travel Channel they will be joined by the Hollywood Ghost Hunters! The Hollywood Ghost Hunters consist of Kane Hodder ( Jason Voorhees), Rick McCallum (Darkwolf), RA Mihailoff (Leatherface), Danielle Harris ( Halloween), Chris Carnel ( Miner, My Bloody Valentine), Adam Green,( Director: Hatchet, Frozen, Spiral), Richard Friedman( Director, Born, Darkwolf), Robert Pendergraft ( FX Make up, Hatchet 2), Steve Nappe ( Jason X) Jason Miller( Producer, Hatchet 2, Infected) Jim O'Rear, Barry Blaisdell, Louis Horowitz and Brian Collins. The two factions join up as they invetigate a once-opulent hotel where 19 Chinese immigrants were murdered during a vicious race in 1871. New Clip From HATCHET II Shows Victor Crowley Versus Leatherface-Legend Versus Legend! New HATCHET II Red Band Trailer Shows Buckets and buckets and buckets of blood!